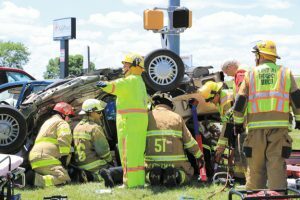 Emergency services personnel responded to the intersection of Route 309 and Old Packhouse Road in North Whitehall Township on June 15, 2018, for an MVC with entrapment. Crews arrived on scene to find one person trapped and injured in an overturned sedan. Two people in another sedan were also injured and taken by EMS to a local hospital. – Fire News photo by Dennis Wetherhold, Jr.